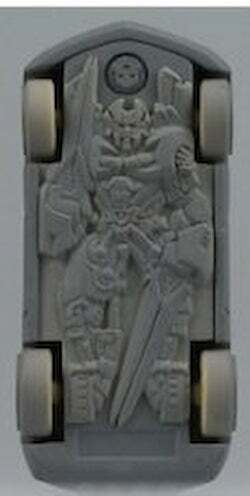 Leaked photos of a clay mold for a cheap Transformers: Revenge of the Fallen toy of the Corvette Centennial Concept may be showing us the robot mode for a character we're told will be called either "Hot Rod" or "Stinger." So cheap in fact, it doesn’t actually transform, instead relying on a carved depiction on the underside to please the robot-loving kiddies. The interesting thing is the 2D robot’s design is nearly identical to the supposedly fan-made Stinger renderings that leaked last week, clearly showing large double-edge blades in place of hands.